Deliver a fast and flawless finish with our professional quality Airbrush Kits, teamed with the market-leading Airbase Make-up. This MUA Kit includes an airbrush, a compressor with air hose, 7 shades of Airbase Silicone-based Foundation (10ml), 2 shades of Airbase Silicone-based Blush (10ml), Airbase Silicone-based Bronze (10ml) and Airbase Thinner & Cleaner (30ml). 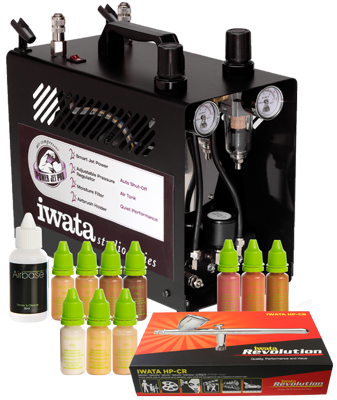 The Iwata Revolution CR airbrush included is dual-action, offering maximum control over delivery of paint. With a soft and even spray pattern, the CR offers greater comfort when used on the face and body. It has a larger 0.5mm nozzle, perfect for spraying Airbase HD Airbrush Make-up. The Iwata Power Jet Pro compressor is powerful and can run two fine airbrushes or one high-flow airbrush or a small spray gun. It has dual air regulators and gauges for setting the pressure for each airbrush independently. It also has a 2 litre tank reservoir, which increases moisture separation and smoothes out the air flow. It features an automatic switch, automatically turning the compressor on when you press your airbrush trigger, providing instant air at the pressure you have set it, and turns the compressor off again when the airbrush is not in use. It has a duty cycle of 60 minutes continuous use. Please click here to view our Airbase Airbrush Kits. 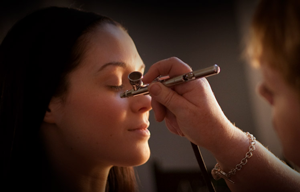 The Power Jet Pro incorporates a pressure regulator which is extremely useful when airbrushing make-up as it allows you to reduce the pressure when working on the face, particularly around the eyes. For further convenience of control you may add an end-of-line Sparmax bleed valve, an end-of-line moisture filter with bleed valve or a quick release body with air valve with a quick-release plug. And you may upgrade the foundation pack to 30ml bottles (with 100ml Thinner & Cleaner). Please select from the options at the top of this page. 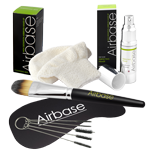 With this kit, you receive 30% off Airbase makeup purchased in the same transaction and all future transactions. We register your kit order as proof of purchase so you do not have to show it again for future orders. You may add an accessory bundle to your kit in the options at the top of this page, which includes the MUA Kit 30% discount. Or you may add any Airbase items to your cart separately. As you add the first Airbase makeup product to your cart, select the discount option at the top the product page to receive 30% off the listed price. There is no extra discount available on ABFOPACK10 and AAQPACK because our price already includes at least 30% off the separate items. 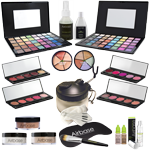 MUA KIT discount on ABFOPACK30 and Airbase Aqua Body Paint is 12.5% because our price already includes the MUA 20% discount.